Find your height at the top or bottom of the chart. Click Here for chart. 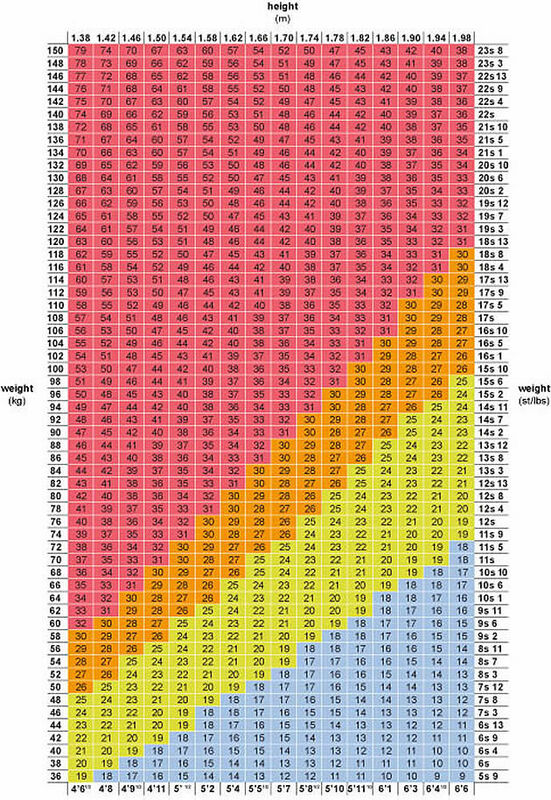 Follow the column up or down until you reach your weight to get your BMI rating. Click on the relevant box below to see what your rating means. Adults with a very athletic build (eg, professional athletes) could show as overweight. This is because muscle weighs more than fat and the BMI does not take this into account. If you’re pregnant, the BMI does not apply. You should seek advice from your doctor or midwife on what a healthy weight is. See your doctor if you require a more precise reading. Your BMI is a great starting point but you should also measure your waist. This is because people who carry too much weight around their middle have a greater risk of developing coronary heart disease, high blood pressure and diabetes. Why are there separate measurements for Asian men and women?